I consider this the best way to recycle leftover of “Rice vermicelli with vegetables”. The ratio of leftover and eggs was about 2:1. 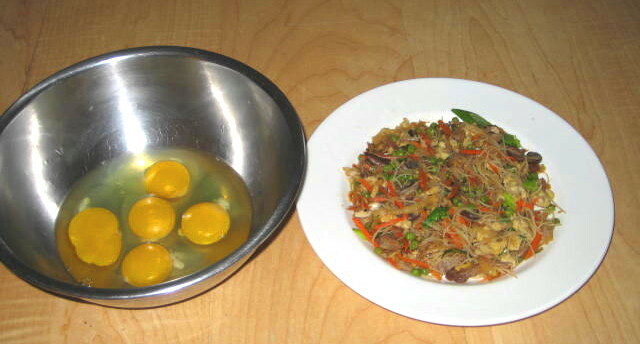 I used 5 eggs and 2-1/2 cups of vermicelli, veggies and meat. 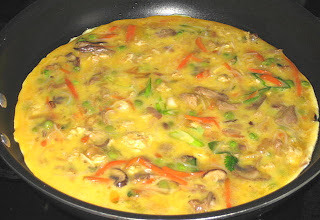 Just beat the eggs with little salt, mix thoroughly with leftovers, pour in fairly hot non-stick frying pan and cover. Lower the temperature and cook till top of frittata is set. Now you have two options: slide it on a plate and turn over back to frying pan or slide frittata on steel preheated pie pan and place under broiler (my option, using toaster oven set at 450 °F broil). When eggs are cooked through it is ready to serve. 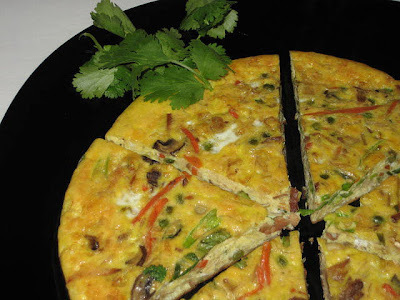 As with any frittata this one is even better at room temperature.